The Royal Palace was built as a residence for King Carl Johan, but was not completed until after his death. On 15 March 1849 the Lord Chamberlain took possession of the new palace on behalf of King Oscar I, and on 26 July it was formally inaugurated in the presence of the whole Royal Family. 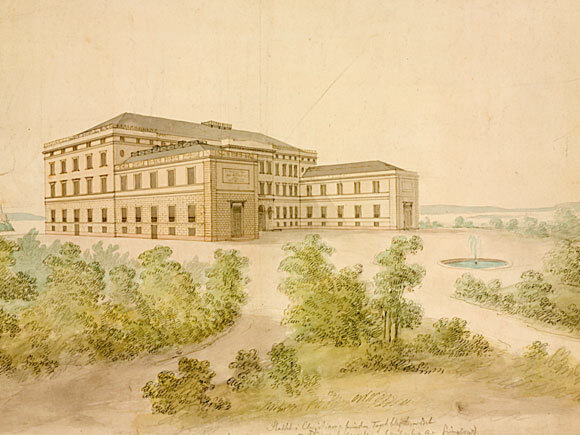 The proposal to build a royal residence in Oslo was raised in the Storting (Norwegian national assembly) for the first time in 1821, but this was not followed up until the following year, when King Carl Johan himself proposed it to the Storting. 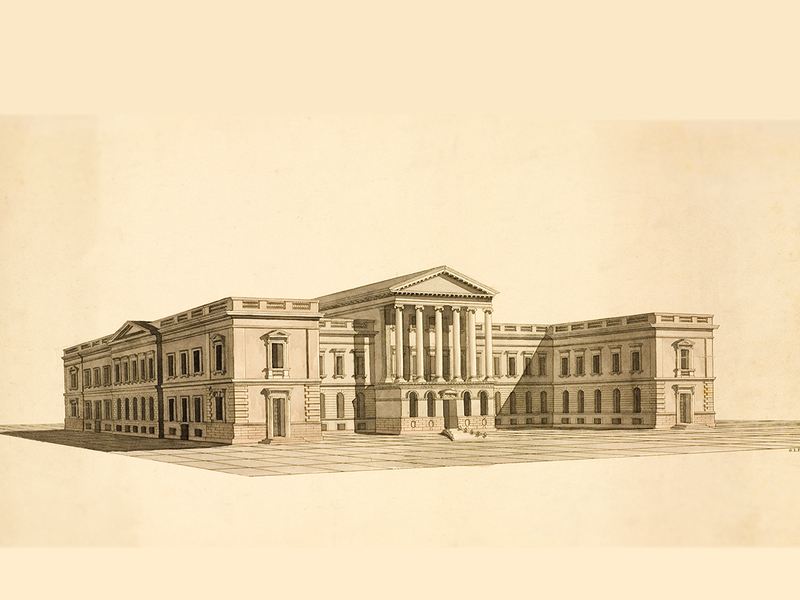 In spite of the pressures on the Norwegian economy, the Storting allocated 150,000 rix-dollars for the work, and in 1823 a commission was appointed to oversee the sale of government bonds to finance the project and to have overall responsibility in matters concerning the building. 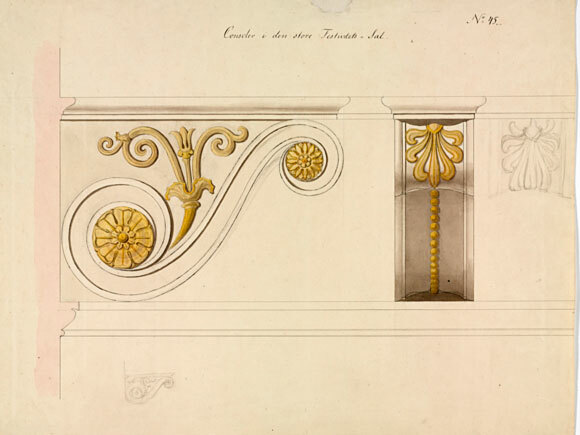 The Danish-born architect Hans Ditlev Franciscus Linstow (1787-1851) was commissioned to design the new palace. There was no obvious choice for the site of the new palace, but the question was decided by Carl Johan during a ride on Bellevue hill, west of what was then the city centre. 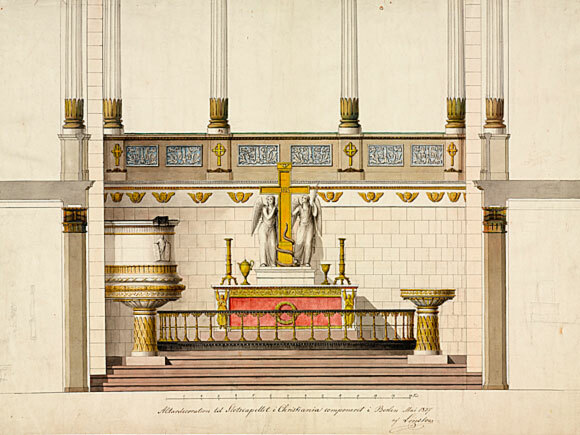 The land was purchased in July 1823 and on 1 October 1825 the King laid the foundation stone at the intended site of the altar in the Royal Chapel. By 1827 the palace foundations were completed. However, most of the allocated money had now been spent, and between 1827 and 1833 all building work ceased, since the Storting was not willing to grant further funds. The original plan was a building in the shape of an H, but this had to be revised for financial reasons, and it was decided to build a simple U shape. By summer 1836 the exterior was completed, and Linstow travelled to Denmark and Germany to find inspiration for the interiors. The rooms were completed during the 1840s in accordance with Linstows designs. When King Carl Johan died in 1844, it was immediately apparent that the Palace would be too small for the new Royal Family. The Storting granted an additional allocation for the purpose of beautifying the exterior and enlarging the wings. The original roof, which no one had considered to be satisfactory, was lowered, and a monumental temple front with pillars was added to the main façade. A variety of changes have been made to the Palace since it was first inhabited in 1849. At the end of the century the sanitation was improved and electricity was installed. Until King Haakon VII and Queen Maud arrived in Norway in 1905, the Palace had only been lived in for short periods at a time, during visits to Oslo by the Norwegian-Swedish King. It was therefore quite unsuitable as a permanent home for the new Royal Family. In order to meet their needs a set of Royal apartments was installed, with bathrooms and lavatories. Minor rehabilitation and maintenance work was undertaken during King Olav Vs reign (1957-1991). When Harald V became king at the beginning of the 1990s, a survey of the building showed that it was in need of a complete renovation. The state of the electrical system aroused concern, the kitchens and sanitation had seen very little improvement since 1906 and the working conditions for the staff did not comply with the national working environment regulations. The fire alarm system and fire walls were inadequate and the emergency exits were not secure. The façade had not been properly maintained and there was discovered rot in the floor beams. The layout of the rooms was functionally impractical. In 1993 the Royal Court presented a general plan for the renovation of the Palace, and the Directorate of Public Construction and Property was given the task of restoring the building and upgrading the Royal Apartments. The rebuilding and rehabilitation was carried out in consultation with the Royal Family and representatives of the state, the Royal Court and the Directorate for Cultural Heritage. The work involved comprehensive and complicated changes. On 15 March 1999, 150 years to the day after the Lord Chamberlain took possession of the original building, the Directorate of Public Construction and Property was able to deliver a completely restored and renovated building. The furnishing and decoration of the Royal Apartments was undertaken as a separate project in 1999 under the leadership of the Royal Court. The apartments were completed in spring 2001. May 2011, rehabilitation work started on the roof over the main wing of the Palace. The project "Roof over Roof" finished late 2012.